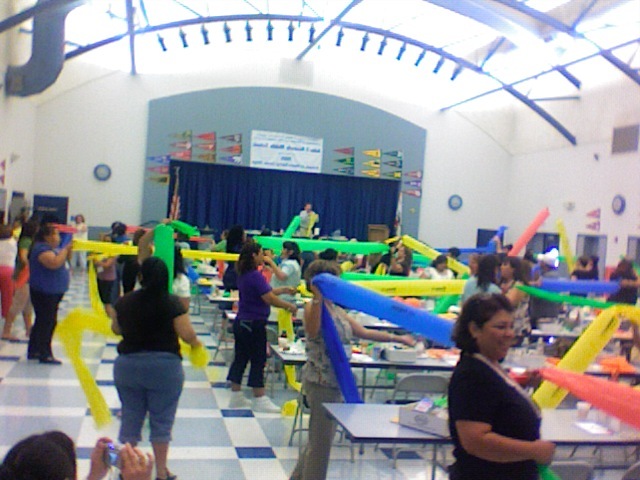 Imagine a room filled with 183 energetic early childhood teachers and you’ll know how fortunate I was to present our Hands-on Science Secrets workshop in El Centro, California. Heather Vessey-Garcia worked for almost a year to plan every detail of the event… down to lightning fast on-site registration and a killer lunch (always important when teachers are showing up on a Saturday). Speaking of Saturday, I can’t begin to thank all of the participant for taking their personal time on the weekend to attend the workshop, but this shouldn’t surprise anyone who works with early childhood educators. The El Centro teachers were eager to learn about new activities for their children and to share some of the things that are working best for them right now. As always, if you attended the workshop, I’d invite to share a comment on ways you’re using the materials and information with your students… but don’t blame me for making a mess with the Mentos and Diet Coke eruption. Sign-up for the Experiment of the Week Teachers Appreciate Messy Gifts!